The requirements of a valid will are determined by state law. Usually a will is subject to the laws of the state in which it's executed, and most other states will also recognize the will's validity, with some limitations, if it would have been valid where created. Generally, a will needs to be witnessed, but not necessarily notarized. Most states require a will to be witnessed by two or more persons at the time it is signed by the testator, the person making the will. Some states will not allow persons eligible to receive property under the will to act as witnesses, but many do. The witness serves her function by observing the testator's execution of the will and then affixing her own signature, usually without the presence of a notary unless state law expressly requires notarization. Later, a witness to the will appears in the probate court where the will is submitted after the testator's death to verify the validity of the document. Some states have statutory provisions for what are called self-proving wills. These are wills that are presumptively valid upon filing in probate court without the appearance of a witness to the execution. The characteristic feature of a self-proving will is that it has attached to it signed and notarized affidavits of the witnesses. 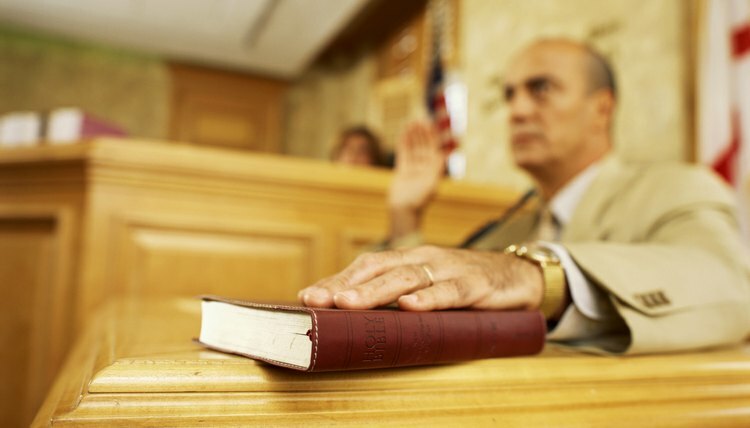 These affidavits contain statements in which the witness swears to the validity of the will. Because they are notarized, these affidavits are accepted by the probate court as effective testimony to the will's validity. Most states, even those that allow interested parties to act as witnesses, have additional requirements as to who can testify to the validity of a will. Generally, such persons must be competent to testify in court, meaning they are mentally sound. Some states also require the witness to be "credible," which can exclude felons or those convicted of crimes of moral turpitude. Having a witness execute a notarized affidavit along with signing as a witness, or having the will itself notarized, could prevent invalidity of the will if a competent witness cannot be found at the time the will is probated. Some states also recognize wills that are not witnessed at all, subject to certain conditions. Called a holographic will, a handwritten will might be valid if the testator's handwriting can be effectively identified. In states where holographic wills are valid, all parts of the will that convey property or assets must be entirely written in the hand of the testator, and the document must bear his signature and, usually, the date. What Makes a Will Legal & Binding? When executed wholly and correctly, a will is a legal document that supersedes any other document, contract or verbal conveyance the testator may have established during her lifetime. This is because a will is a type of one-sided contract, defining the wishes and instructions of the testator as she herself describes them without any outside or undue influence. However, there are multiple facets of a will that establish it as a legal, binding document. Signatures of witnesses are usually required for a valid will. A valid holographic will does not require witnesses. To prepare a holographic will, the testator writes his wishes in his own handwriting. California Probate Code Section 6111 sets out the law for holographic wills.